Until they were one year old exactly, I took a photo of both my children, mostly in the same place and position, every single week. There are 56 photos for each in total, as there were a few special occasions thrown in for good measure. 1. Life with a newborn is a blur. Even more so when you have a toddler to consider too. A photo a week is easily doable and you don’t have to worry if you’re a few days out here or there. *As a side note, cheap changing mats are a false economy, as demonstrated by the fact my son’s changes half way through. I learnt my lesson second time around. 3. They change so quickly. A week is just the right amount of time to notice those changes, especially at the beginning. Their little pudgy faces even out and gain more character as they grow and it’s great to look back and compare week to week, month to month, beginning to end. 4. 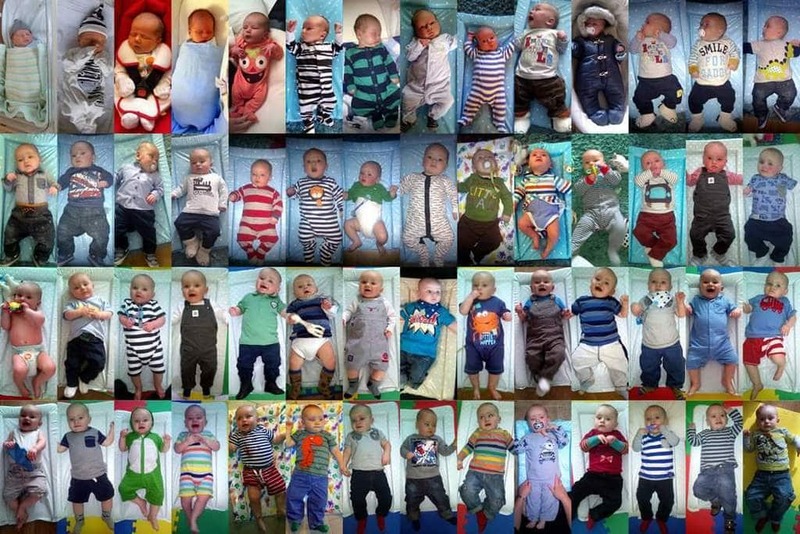 You get through an inordinate amount of clothing and some of those outfits, worn a handful of times, or even just once, before they outgrow them, were pretty damn adorable. And expensive. 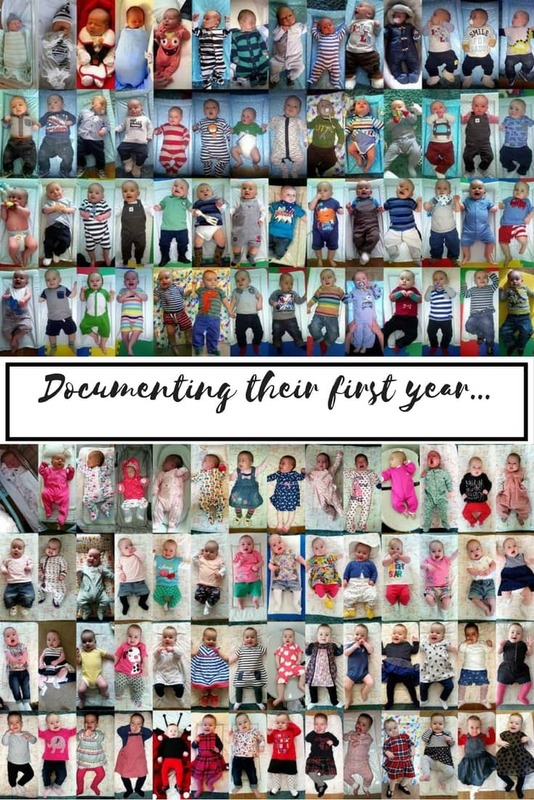 This is a great way to record your favourite outfits, and a few interesting things like their first swimming trip and first pyjamas. Keepsake soft toys are a wonderful way to do this too but I seemed to never get round to organising them. Plus I think I would have too many clothes to choose just a few! Not only that but I am absolutely drowning in soft toys. Even if you separate the keepsake ones, I think there is a danger they will be put away and rarely looked at again. 6. They make great gifts, or a great ‘birthday month’ page for photobook style calendars, which are very popular these days. Both sets of grandparents got a framed print of ours and they were thrilled. 7. They are a slightly more interesting version of the ‘baby photo’ and, as such, are more of a talking point. I think this means they are more likely to be kept on display, when the usual baby photos may get replaced in time with more up-to-date images. 8. There are lots of little details in each photo that have significance for us. For example the footprint changing mat that features in both is the one at my mother’s house in France. I like the fact that it features in both and that those in-the-know will remember they were visiting their nanny and grandad when that particular shot was taken. 9. Lastly, I think they will be invaluable when it comes to embarrassing children in later life – at eighteenth birthday celebrations and wedding receptions. 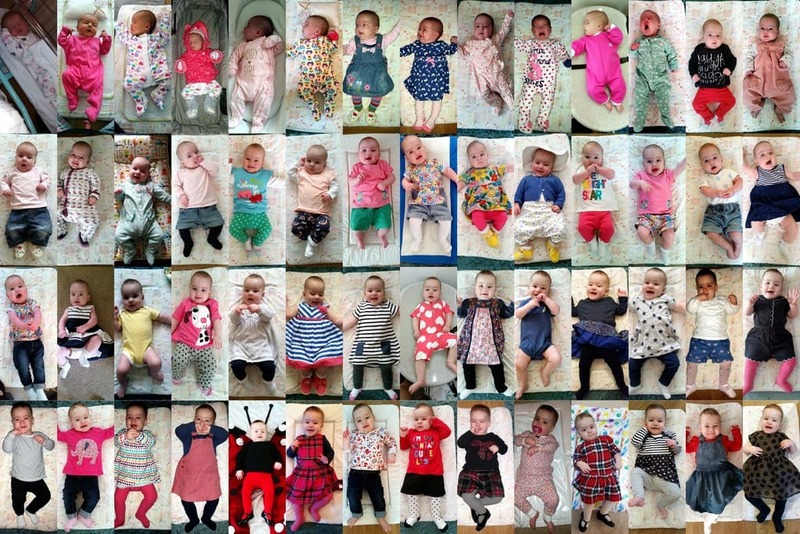 Whichever way you choose to document your child’s milestones, for the first year and beyond – whether you take a photo every day, every week, with milestone cards or without, if you have keepsake sleepsuit bunnies or not, there is no doubt that recording it in some way is an eminently sensible idea. Every time I look back at my son’s collage I am amazed by all the new little details and the memories they generate, and he is only three. I look forward to doing this with my daughter’s, and looking back at both, for many years to come. Nice plan, way too late for me to follow, but maybe the grand’s will like the idea when they have children. Oh wow this is great! I would love to remember to do this with Baby #3 when he or she arrives! This is a great idea. It’s incredible how much newborns change even in the space of a few hours. 4 makes a lot of sense. Now cub has hit the 3 month mark we’re putting away clothes into storage that have never been worn and still have the tags!